One of the many things that I find difficult about not having my dear husband with me anymore is the sheer number of things I now have to figure out how to do. For 30 years I relied on him for so much; much more than I ever realized until now. This is my story and my guide to help out other widows who are thinking they would like to have a Compost Tumbler. -Lori B. 1. First you decide you want a compost tumbler for your back yard because gardening and yard work will keep you busy, right? So, you go on line to Amazon because there is no way you are going to a local store and talking with anyone about the reason you are buying this and putting it together yourself. 2. You receive the tumbler a few days later and set the big box just inside your front door and then you look at it for 5 days wondering why you thought you wanted it. How on earth are you going to put this together yourself? You briefly consider asking a neighbor or hiring a handy man to do this but that would require talking with someone and asking for help. That’s not going to happen. You can do it, right? 3. So……On about day 5 you are sitting at home alone and think to yourself “I can do this.” I have two college degrees for goodness sakes, how hard could this little tumbler be? Looks simple enough on the picture and there is no electrical or plumbing involved. Easy, right? So you say it again, “I can do this,” and you take the box out to your deck and set it down. 4. You then proceed to eat breakfast, feed the dog, wash some laundry, hang some laundry, do the dishes, change the bed linens, pull some weeds…….. basically avoiding the big box on your deck. But the box is out there so now you have to give it a try cuz you’re not going to put it back in front of your door and admit defeat. So… you say to yourself with more determination this time “Yep, I CAN do this.” A few little tears begin to well up in your eyes. Lord, I know I always ask for strength to get thru the day, but today I am asking for my brain to work cuz these instructions cannot be written in English. This is where you remember something witty your husband used to say: “like a pig looking at a wrist watch.” So… two more times you repeat “I CAN DO THIS! !” and you are just a little bit angry at your husband for not being there to take over at this point like he usually did. 68 short bolts and nuts- check. WHAT!!! 68????? 7. Now you need to go find a Philips screw driver and something that looks like it has several little octagonal cut outs in it. 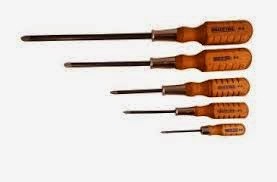 You go to your husband’s tool box and say a little thank you to him for all those tools he bought, and you complained about, wondering why he needed so many. Now, you are really sorry you complained and you start crying again. 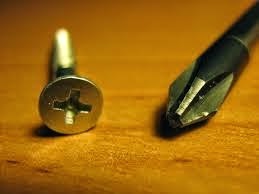 It's always best to match the screwdriver to the screw. 8. Dry your tears so you can see the pictures and double check everything. Wait a minute, you notice that you only have BB but not DD. You look around in the box for what seems like ten minutes and check every other piece. You get confused. Where could it be? Didn't they send it? Great, now you are going to have to pack it all up and send it back! That just takes too much effort and energy and here come the tears again. All of a sudden that prayer you said a little while ago is answered--- your brain kicks in and you notice BB and DD are already put together. Whew! You have everything you need to get started. 9. So… you are going along... You follow the pictures and put the frame together. Looks pretty good and not too difficult. You’re careful to put the nuts and bolts so they are facing inward and you feel pretty smart for thinking of that all by yourself. There are 8 individual panels that need to be carefully put in place to form the barrel and need to be lined up with a center piece to divide the sides and the ends. This is where all the small nuts and bolts come in and you need to carefully put them in place being certain not to add and tighten the center one before adding the next panel that will overlap it (yep speaking from experience) If you do, it’s ok, take it out and do it over again the correct way. 10. Somewhere around the 6th panel you will be feeling pretty excited that you are almost done and then you may experience a nut and bolt issue--- they won’t go together! But take my advice: don’t waste 10 minutes trying over and over again thinking you must be inept if you can’t get a little nut and bolt together. Get another little nut and bolt and move on. 11. One more tip, when you get to the last panel which is the side by side doors, do not forget to look at the pictures again. Don’t let yourself think it is put together the same way as the rest of the panels or you will be taking it apart and doing it over again. (Yep, again I speak from experience). As you are looking at the instructions for the last time you notice a small note that says, It might be handy to have another set of hands. Seriously????!!!!????!!!! 12. So, now it is together. You did it all by yourself. You sit back and admire your work. Yep, you did it and it only took you 3 hours. You are proud of yourself and you can’t help but think your husband would be too. 13. You take a picture and send it to your kids so they will see that you are managing to do more than cry. Lori, you rock!! I stand and stare and stare and stare at the instructions until my 15 yr old rips them from my hands and tells me he knows what to do. Then I look at the instructions again to try to figure out what he did wrong.